Halifax II DG253 attacked by a night fighter west of Denmark 27/7 1943. The aircraft belonged to 138 Sqn. Bomber Command and was coded NF-F.
T/O Tempsford 21:54. OP: SOE to Denmark. 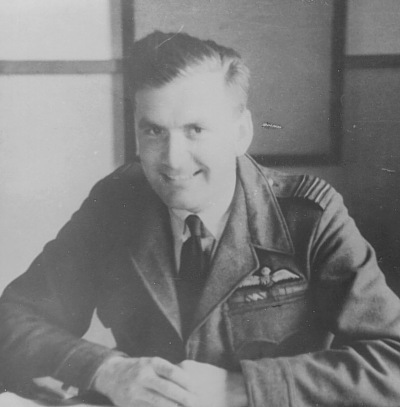 Wing Commander Richard Douglas (Dickie) Speares task was to drop supplies and two agents in Denmark. At Table Margarine/Table Gossip 4 on the position 56`47`31N 09`57`00E near Madum Lake 13 kilometres north west of Hadsund and 13 kilometres south south east of Volsted there would be resistance people from Aalborg waiting to receive the four containers and a parcel plus the two SOE agents Jens Peter Petersen (Code named Tripe) and Aage Møller Christensen (Code named Margarine). The Halifax dropped its load at 01:16 according to plan except that the first agent to go (Petersen) jumped 3 seconds prematurely. The containers were received all right but the parcel which contained a radio ended up in the middle of the lake. Also Christensen landed in the lake 60 feet from the shore. After the drop Speares continued to Table Sandwich / Table Gossip 5 on position 55`31`50N 10`32`08E at Enebærodde 8 ¾ kilometres east north east of Otterup and 17½ kilometres north northeast of Odense on the island of Fyn (Funen). At 01:56 Speares dropped four containers and two parcels. The course was now set for the Danish west coast at Hvide Sande flying at 500 feet. 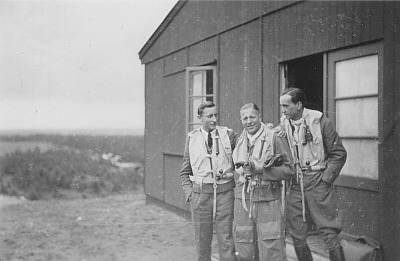 At 01:23 Leutnant Hermann Stock of 12./ NJG 3 and his crew took off from Fliegerhorst Grove flying JU 88C-6 coded D5+FX. The name of the Bordfunker was Bordfunker Gefr. Willy Eiben while it is not clear who the Bordward was. Soon they were under control of “Ringelnatter” radar station which was based north west of the city of Ringkøbing. Flying at 3000 metres Stock spotted the Speares Halifax in the light of the full moon but when it suddenly turned, he lost sight of it. Once again Ringelnatter led Stock towards the Halifax and he caught sight of it again at 300 metres about 800 metres away. The Halifax was still flying defensive but this time Stock kept it in sight. They now left the Jylland (Jutland) peninsula and flew over the North Sea. Speare flew very low and Stock who tried to get even lower noticed that his altimeter indicated that he was flying below zero due to being adjusted to Fliegerhorst Grove which was at 50 metres. The Halifax was still twisting and turning and since Stock was not able to get below it planned to fire his guns at it when it turned it side towards him. Suddenly Stock heard a loud bang and thought that he had collided with the Halifax. The JU 88 was shaking violently and the engines were fluctuating between 800 and 2600 rpm while still flying at zero metres altitude. Stock kept the course at 270 degree and was able to gain only 1 meter of altitude per second. It was not quite clear where they actually were since they had not had radio contact since the chase started, and that had happened in Pl.Q. MQ. When he reached 200 metres he slowly turned the JU 88 back towards east and Jylland. They were approximately 90 kilometres out to sea and were not very happy with the possibility of having to bail out. Still climbing slowly they were able to maintain a airspeed of 200 km/hour witch raised to 210 when they stopped climbing after having reached 400 metres. When they reached the coastline the funker tried to make radio contact with Grove but without success. The managed to find Grove and landed at 03:56 hours. When the crew got out of the JU 88 they saw the reason for their problems. The tips of the propeller blades were missing. On the left hand propeller there were only about 1/3 left while the right hand propeller were missing about 1/3. Also an 80 centimetres long radio antenna placed underneath the fuselage of the Ju 88 was missing. 56`01N 07`50E. 02:35 hrs, 500`- JU 88 crossed behind a/c at 300 yards from starboard to port. It then came in again from port quarter with 2 white lights on wing tips. He opened fire putting lights out. R/G replied with long burst. JU 88 turned to starboard, climbing to 5/600`, R/G giving second burst as our a/c turned to starboard. 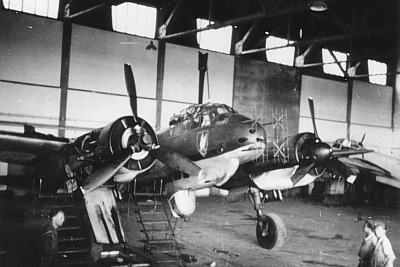 JU 88 then disappeared to port. R/G claims to have hit JU 88 in port engine. 55`38N. 05`28E. 03:10 hrs, 500`- an a/c was seen at 1.000 yds. behind with two white lights on wing tips which flew for a short time on parallel course, then disappeared. After the combat W/Cdr ”Dickie” Speare continued towards England and landed at Tempsford at 05:22 hours. W/Cdr Richard Douglas “Dickie” Speare DSO DFC was a very experiences pilot who had started his flying training at Royal Air Force No. 9 Flying Training School in 1936. 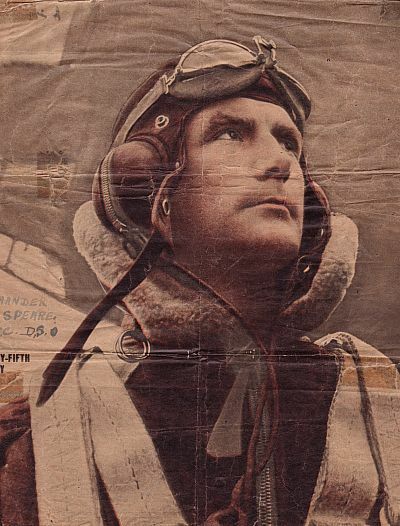 He had served with 38 and 75 Sqn before he in 1940 was transferred to No. 15 Operational Training Unit. May 1941 he was transferred to No. 7 Sqn. He served with different training and operational units until 2/6 1943 when he joined 138 Sqn. He served with this unit until 9/5 1944. On 24/9 1941 he was Mentioned in Dispatches and on 21/11 1941 he was awarded the Distinguised Flying Cross. 13/8 1943 he was awarded a Bar to the Distinguished Flying Cross and on ¼ 1945 he was awarded the French Croix de Guerre with Palme Degree 583. He lost his life in a flying accident on 23/11 1945 when he in Avro Anson NL185 of Halton HQ Flight hit a hill on Edale Moors during bad weather. He was laid to rest in Bournemouth North Cemetery on 30/11 1945. It should be noted that Stock was actually credited with the destruction of a Halifax at 20 metres altitude in PL.Q. 05 Ost MQ-74c on 27/7 1943 at 02:39 hours. 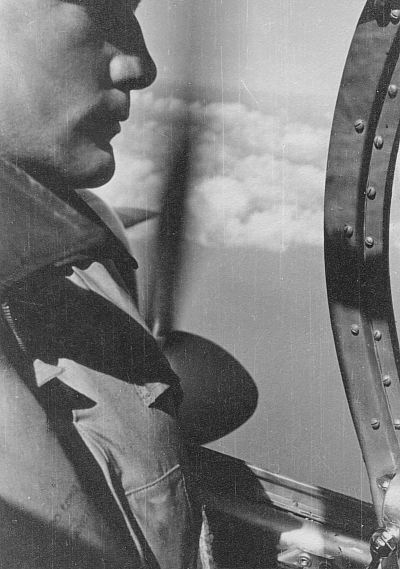 Stock had just arrived on Fliegerhorst Grove when he was involved in this combat. He served as a Technical Officer in 12. /NJG 3 until March 1944. He survived the war. Sources: Letter from Stock dated 28/11 1969, AIR 20/8258, Chris Speare, Nonnenmacher file, TW, “Kontakt med England” by Jørgen Hæstrup.